Teachers and children spend many hours in school trying to concentrate and learn. 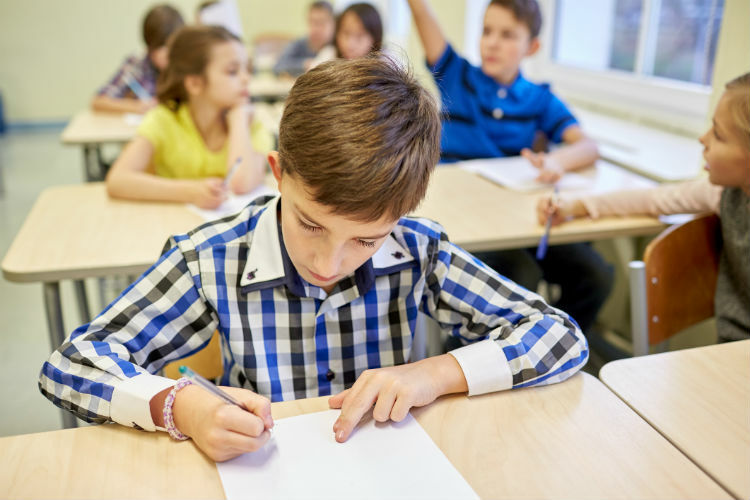 Often this takes place with noise in classrooms – in small classrooms, noisy halls and old school buildings which were built before anyone was paying attention to noise reducing materials and a good sound environment. It is important to know which possibilities there are to improve the situation, both in terms of creating a good learning environment for the children and in terms of preventing stress and tinnitus for teachers. It does not necessarily have to be an expensive solution, but a lot of cheap alternatives can make a difference too. Schools are rarely built by acousticians and thirty years ago, the focus was not always on creating good sound in public buildings. These years, a range of noise reduction products is available both when building or renovating schools. However, even easily accessible solutions like sound absorbing paintings, furniture and elements in the ceiling can help to lower the volume in the classroom. Many schools have a tight budget and classroom renovation is not an option. In this case, try putting up extra notice boards to reduce noise. You can even place nice plants in the room and benefit from the sound absorption. Imagine that. No matter how good the acoustics are, there will always be sounds and noises in class especially if you place 25 kids in a small classroom on Friday afternoon. How to control it? One way is to make children aware of how their surroundings affect their concentration and learning environment. The more awareness, the better chance there is for the teacher to make a change. Noise can be an abstract phenomenon, especially for kids. Often children are not aware of high sound levels. 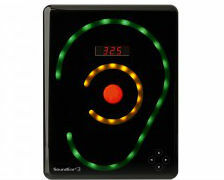 SoundEar has sound monitoring equipment which in a very visible way shows when the noise level is too high. This helps both teachers and kids to self-regulate the noise level in class. Make noise a subject of the week, and give the children the task of keeping an eye on the noise levels. This creates awareness, and you can afterwards collect data from SoundEar and see which initiatives improved the noise level in class over time. Most teachers know in which parts of the school there is a noise-related problem, but do the teachers and board agree, and how long do teachers and children have to live with it before a solution is found? Start out by finding out all the areas and classes where teachers have experienced high noise levels. This can be supported by real data about the noise levels in class. You are welcome to contact SoundEar, who can give you advice on how you should proceed. 4 tips and tricks for a quiet classroom – do you have a 5th? Have you experienced or worked with initiatives helping reduce the noise level in classrooms? This entry was posted in Noise and health, Noise at school, Noise at work, Noise measurement, Noise recommendations, Noise reduction, Tips and tagged Tips on handling noise. I like that you talk about all the different options there are for sound acoustics in a building. It makes sense that a lot of schools, being older buildings, won’t have proper acoustics which could cause classrooms to be much noisier than necessary. Updating any building’s acoustics could make it a much more comfortable environment so it’s something to remember whether it;’s a commercial space or a school because echoes can be quite annoying inside. Glad that you like our blog. If you have questions regarding our products and how they work in different environments besides what is mentioned here just let us know. I work for an outreach team. We go into a variety of schools to upskill staff to use strategies that help all children and particularly those on the autism spectrum. Adding felt sticky pads to the ends of chair legs helps reduce the noise in rooms without carpets. One primary school has popped a tennis balls onto the end of chair legs. This has also created awareness of autism. I suspect there are increased levels of concentration and lower levels of behaviours causing concern in classrooms that have reduced noise. Thank you for sharing your story. Yes, felt pads on chair legs is definitely a good idea – I had not heard of using tennis balls before, but that would sure work too. I find it very interesting and can imagine how noise surrounding autistic pupils may cause interruptions and make for a difficult teaching situation. I was talking to a friend the other day about her interest in environmental noise management. This made me interested in learning more about this type of management in places like classrooms. It was fascinating to read that creating awareness makes the problem less large. I am glad to hear that you found the part about creating awareness interesting. If you would like to learn more about visualization as a tool for noise reduction in schools, you can take a look at this research paper in which they reduced noise levels in a classroom by 1.4 dB(A) using visual feedback.